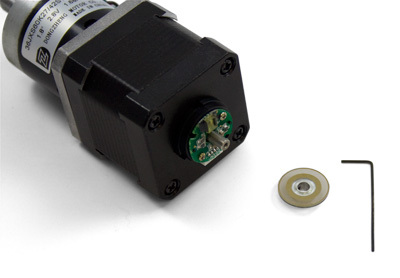 This compact, economical optical quadrature encoder can be attached to the 4mm rear shaft of a motor. 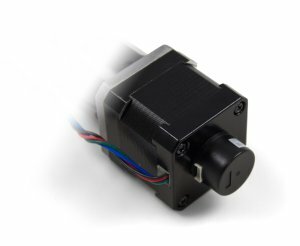 It has 300 counts (full quadrature cycles) per rotation and can be installed by fitting it over the shaft, mounting it to the back of the motor, and tightening the set-screw. For complete assembly instructions, take a look at the user guide. This encoder does not support the use of an index channel. 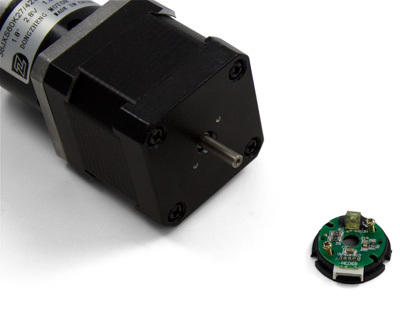 The mounting holes on the HKT22 encoder line up with the holes on the back of any rear-shaft stepper motor sold at Phidgets Inc. For a list of compatible motors and encoder interfaces, see the Connection & Compatibility tab. Take the plastic base, the encoder PCB, and the two screws (the screws should be inside the encoder cap). Place the PCB with the white connector facing downward so that it fits into the space on the plastic base. Take care not to touch the optical sensor on top of the PCB, because your fingerprints could affect the operation of the sensor. Place the screws in the two holes in the PCB. Line the parts up with the mounting holes on the back of the motor. 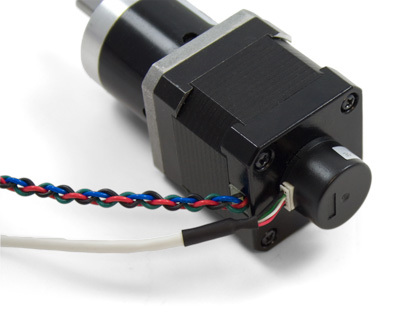 It doesn't matter which way the encoder is facing, but for cable management purposes you may want to have the connector facing the same direction as the motor's wires. Screw the parts onto the back of the motor, tightening until there is no visible gap between the PCB and the plastic base. Do not over-tighten. 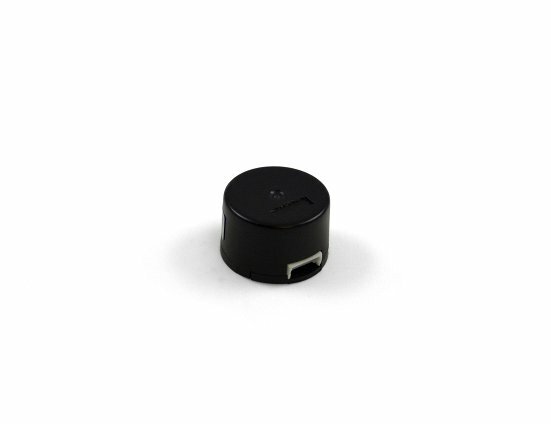 Get the encoder disk and hex key. 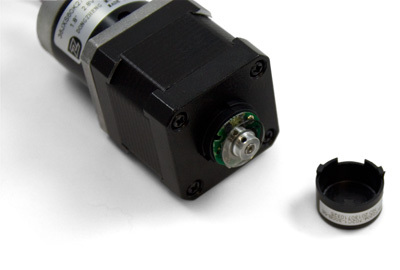 Do not touch the surface of the encoder disk, as your fingerprints could affect the operation of the optical sensor. Place the encoder disk on the rear shaft of the motor with the metal coupler facing outward. Slide the encoder disk until the surface of the disk is approximately 1.5mm from the optical sensor on the PCB. Use the hex key to tighten the set-screw on the coupler of the encoder disk. Double check everything before attaching the plastic cap; it is very difficult to remove once it snaps in place. Attach the included encoder cable and you're all done! 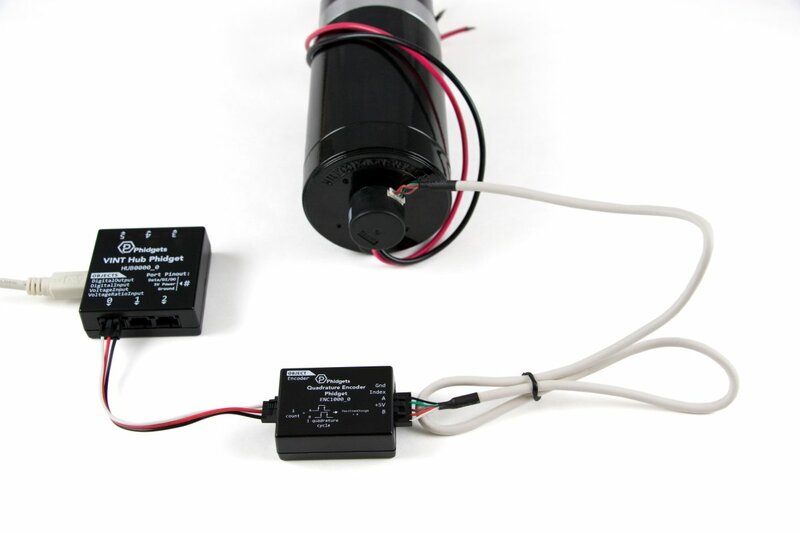 For further instructions, visit the user guide for the motor controller and encoder interface Phidget that you're using.